When one hears “Canary Islands” who doesn’t think of a colorful chorus of birds in the local pet shop or that bright yellow soul swinging in the living room? While most of us assume the group of islands off the African coast derive their name from the bird, it turns out it’s the other way around- the birds are named after the Islands, whose name originally had nothing to do with birds, and may actually refer to native island dogs! Many historians use as a starting point for the origin of the name Pliny’s 1st century account of the islands being populated by large dogs, two of which were presented to Juba, the King of Mauritania, possibly the first discoverer of the Islands. When the Canary Islands were re-discovered by Roman sailors, it was said that one of the Islands was overrun by wild dogs. The entire set of islands was henceforth referred to as “Canaria” (“canis” in Latin means “dog”). The problem with determining if this “dog” theory is completely accurate is that by the time of the Spanish conquest of the Canary Islands, there wasn’t any sign of dogs. Nevertheless, “Las Islas Canarias” was firmly established when the Spanish colony formed. 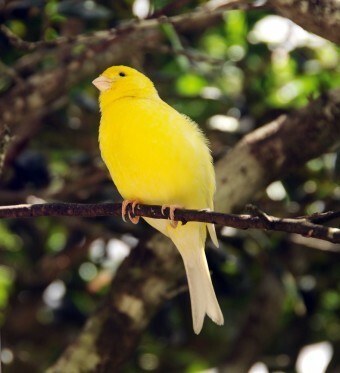 Other theories still abounded as to the etymology of “canary” for the name of the island chain. One theory goes that the name refers to an indigenous herb “Canaria” used to purge the bowels of dogs. In another theory, it’s thought it might be from the name of different plant, “Uva Canaria” (dog’s grape). Yet another theory claims the native Guanches worshiped and even possibly ran wild with dogs and shared their penchant for raw, bloody flesh. The origins of Canary and the ethnic make-up of its inhabitants are still contested. Part of the problem is that the archipelago of the Canary Islands consists of seven islands, each with its own distinct history: Tenerife, Fuerteventura, Lanzarote, El Hierro, Las Palma, Gran Canario, and La Gomera. What is certain about the Canary Islands is that they are beautiful. The exotic and unusual features of the Islands include golden sands that give way to mountains, active volcanoes surrounded by low clouds, and a variety of landscapes from colorful lush flora to a stark pumice-stone terrain. The pumice formations on Tenerife are so distinctively alien that NASA tests its robots there. The mystique of the Canary Islands goes back to the early Greeks, who decided they were the location of the Elysian Fields and the gardens of Hesperides. The Romans took up this idea and proposed that the Canary Islands were the Fortunate isles. It’s no surprise then that later in history, some Christians chose to place Paradise itself among its lush islands. Did we resolve the dog-origin issue? Not really, but the Spanish are proud of their island chain’s supposed canine heritage, however vague its lineage- enough to make dogs a prominent feature of their flag. What we can say for certain, though, is that the island chain was not named after the birds, but rather, the birds were named after the islands. One of the Islands, El Hierro, was once the home of the legendary “fountain tree” or “rain tree”, which for a time provided a significant amount of the island’s water supply. This tree was situated in such a location that fog would pool incredibly densely around it on an almost daily basis for several hours (with surrounding sheer cliffs, near the top of the Hoya de tejis cliffs, “collecting” the fog blown into it.) This resulted in water condensing on the branches and leaves of the tree and dripping down at a steady rate, almost as if it was lightly raining. As drinking water was scarce on the island, the inhabitants would collect this “fountain tree” water. Unfortunately, the tree was destroyed in a hurricane in 1610. One of the worst unintentional airline disasters in history occurred on Tenerife on March 27, 1977, with 583 deaths. The accident happened due to something of a “perfect storm” of incidents. First, a bomb was set off at Gran Canaria Airport. When this happened, all air traffic to the airport was diverted to a much smaller airport in Tenerife. The airport became so crowded that planes were kept on the taxiways themselves. On top of that, a very dense fog came in reducing visibility significantly. What made matters worse was that the Tenerife airport had no radar, so the tower controllers not only couldn’t use their eyes to see where the planes were because of the fog, but also couldn’t track them via radar. They instead relied on the pilots themselves to say where they were exactly and the controllers kept track that way. At a certain point, KLM Flight 4805 taxied onto the runway to take off. At the same time, Pan Am Flight 1736 was still sitting on the runway, but hidden by the fog. When the KLM plane was in the process of taking off, they collided with the Pan Am flight killing all but 61 aboard the Pan Am flight and killing everyone aboard the KLM plane resulting in 583 deaths. Much of what we know of dark matter and universe is thanks to the Canary’s favorable atmospheric conditions which makes it ideal for viewing the heavens. A large telescope resides on La Palma. The dogs are probably sea dogs or seals. There was a colony of Mediterranean monk seals living in the Canary Islands. Seals in Spanish are lobos de mar (sea wolves). The name may also refer to the giant lizards, which were over a metre long before rats were introduced to the Canary Islands. Could the name have come from: giant rats (Canariomys bravoi and Canariomys tamarani). ?